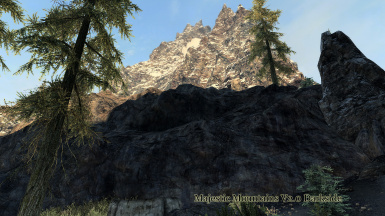 - You are allowed to edit the files and upload your own version of Majestic Mountains. 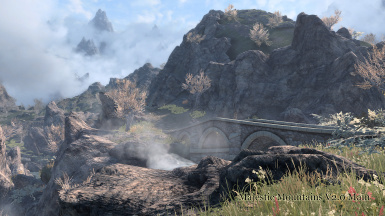 - You are allowed to use the files within your mod (a landscape mod for example). You don't need to contact me first. A simple credit is enough honor for me. reedited all snow shader ini settings. I'm sad because I've released my last version of Majestic Mountains. This version does what I always wanted to do with the mountains. I recreated all mountain UVs from scratch and removed almost all seams on the meshes. Then I added the multilayer parallax shader that allowed me to ad some kind of a makro detail texture. This allowed me to increase the tiling on the meshes without annoying visible patterns. 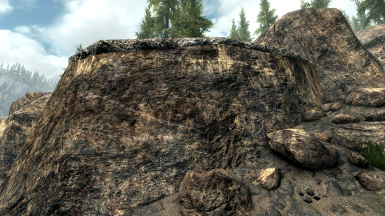 The pixel density was never as high on Skyrim mountains as now. All these changes are creating an incredible realistic and natural look. I hope that you will enjoy my last work and that some mod authors will be inspired by this technique. 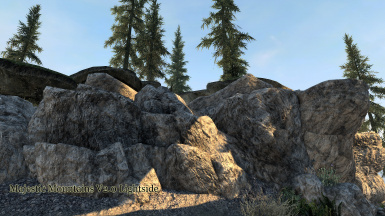 You can use it on most meshes in Skyrim. And finally I hope that someone will continue my work. If you are interested then contact me please. 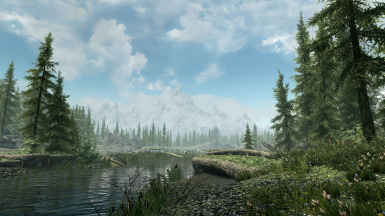 You should rerun DynDolod when updating from 1.84.
mnikjom ﻿for the landscape.esm patch. 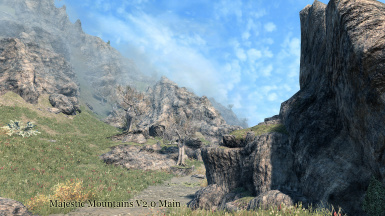 The goal of this mod is a complete mountain rework. 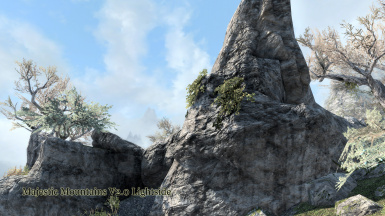 The lighting of the mountains was changed in a way to fit much better to dynamic day night cycles and the weather system of Skyrim. 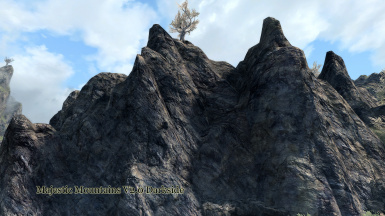 There are several differences to other mountain retextures. 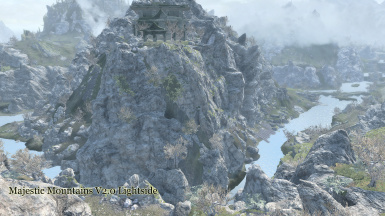 One of the biggest difference is the mountain texture. 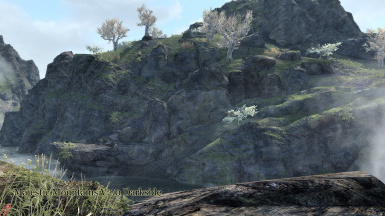 There were two textures used for the mountains originally. But one of this textures was barely used. While looking into this texture data I've decided to merge the two textures into a big one. I've adjusted the uvw data and created a fitting lod. This causes a very natural geologic look. I wanted to prevent the look of stacked stones as much as possible. The second big difference is the moss. 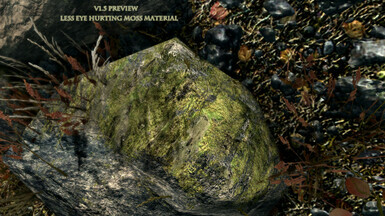 I've created an optional esp wich assigns a projected moss material to the mountains. This prevents the look of texture tiling very effectively. 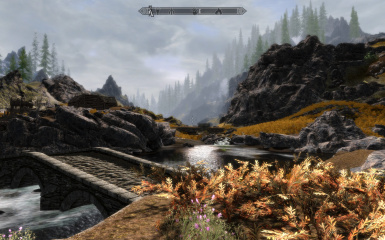 The mod also offers a texture pack for everyone who doesn't find fitting landscape textures. And finally I've managed to get really good transitions from snow covered meshes to snow covered landscape. I've created three different versions: default, Darkside and Lightside. These versions should be able to cover up many different lighting, weather or texture setups. 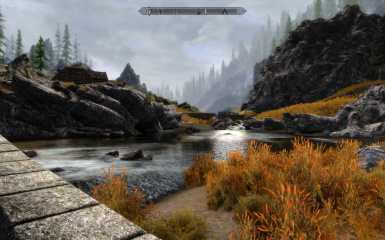 There is a big variation of installed mods in the community and I try to be as compatible as possible. Check out my other mods too. 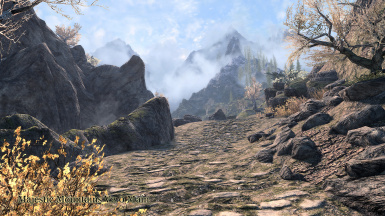 My mods are designed as on mod splitted into three stand alones: Blended Roads , Terrain Lod Redone, Underground and Halls of the Greybeards. Please read the readme before contacting me. I've tried to include the most common problems and the fixes in it. Simply choose the installer pack you want to use. 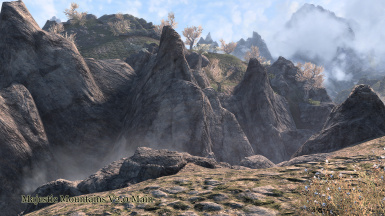 If you are using DynDoLod or SSElodgen you should download the fitting lod pack too.Every version of Majestic Mountains has it's own fitting lod pack with lod textures up to 2k in size. For load order advices I suggest to have a look at TUCOGUIDE. This sites provide very useful informations about load orders. Dolomite Weathers and Majestic Mountains love each other. Really! But you need to install the snow fix wich comes with the installer. This snow fix might be necessary by using some Enbs too. 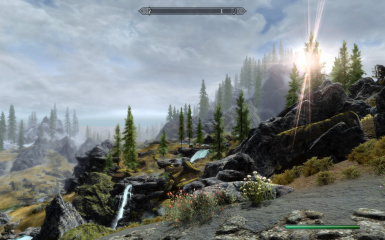 It is listed as Dolomite Weathers in the compatibility section of the installer. 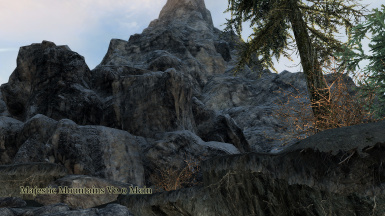 And you should set Majestic Mountains below Dolomite Weathers in the load order because they are using different lod snow settings. NAT also blocks the usage of the Snow Shader. But you should check if "bEnableProjecteUVDiffuseNormals" is set to "1"
This mod changes many things regarding snow too. If you are playing with the improved snow shader you'll be fine. 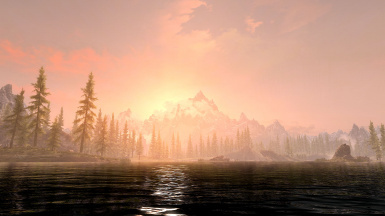 But if you are playing with "Improved Snow" disabled you need to set "bEnableProjecteUVDiffuseNormals" to "1" in your SkyrimPrefs.ini. The snow in this mod is designed to work with a projected texture and otherwise the snow won't fit. Due to the fact that most other snow texture replacers aren't covering the projected diffuse I can recommend Fluffy Snow, Real Snow HD 2k﻿, my Sparkling Snow in the download section (proof of concept) or the snow within the Complementary Pack for a good fitting. Due to the fact that snow is very sensitive to weather mods/ Enb you should choose the snow which fits best to your exterior lighting. 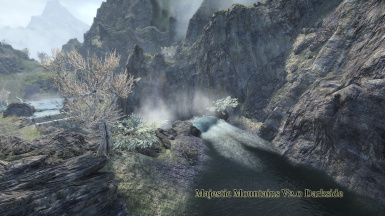 Majestic Mountains 1.59 and up contains some meshes that would conflict with Realistic Water two. 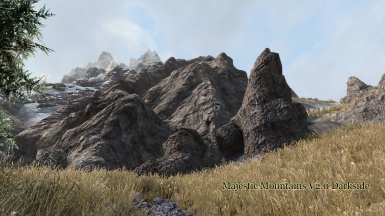 I recommend using the meshes from Majestic Mountains. You should be aware that the Complementary pack needs Blended Roads for the snow roads. 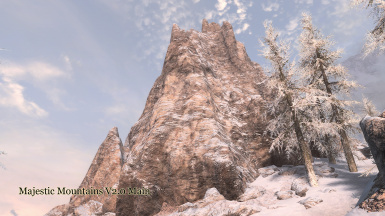 This mod uses custom settings for the Improved Snow Shader. If you are getting too bright snow at night the install the snow fix please. 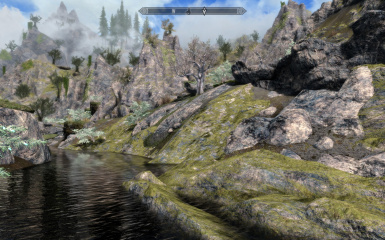 Due to almost removing one mountain texture from Sky this mod conflicts with many other. I dealed with this problem by changing the textures of certain meshes in the esp files instead of editing meshes. This eliminates coflicts very effectively. But there may be mods wich are doing the same. Most conflicts occure with water mods. I created my own fx meshes now and removed some of the redirections within the esp files. If you get asked for overwriting meshes within water mods you should do it. This mod has two optional sun direction esps. This esp files aren't compatible with enb. They will break time of day. 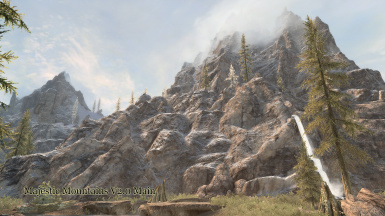 Majestic Mountains is compatible with Better Dynamic Snow too. 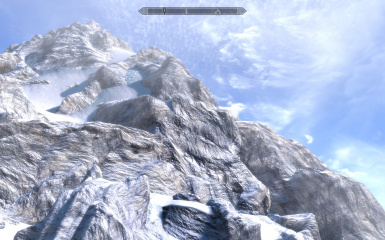 Better Dynamic Snow should be set below Majestic Mountains in the load order. 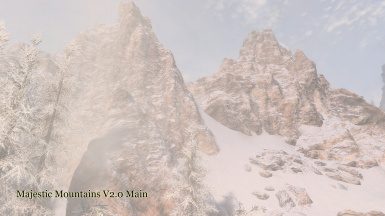 Use Fluffy Snow or the Complementary Pack, disable the Snow Shader in the launcher and set "bEnableProjecteUVDiffuseNormals" to "1" in your SkyrimPrefs.ini. 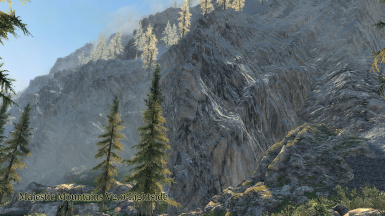 ﻿The mountains are using the same shader material like the glaciers in version 2.0. This material needs multipass snow. You will get grey mountains otherwise. There are a lot of mods that are reverting the snow material back to single pass. This is a problem! Even for lower versions of Majestic Mountains. Because it may destroy snow fitting on earlier versions. 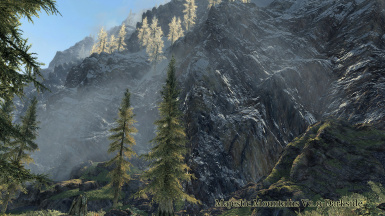 If you are getting grey mountains then move Majestic Mountains lower in your load order. 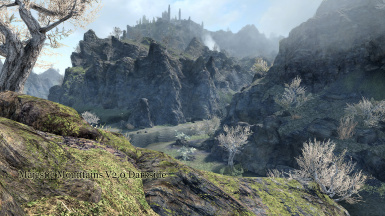 And if you are using DynDoLod then you have to rerun it after changing your load order. I created my own fx meshes now and removed some of the redirections within the esp files. If you get asked for overwriting meshes within water mods you should do it. There are two meshes conflicting with ELFX. I suggest using the EFLX files. 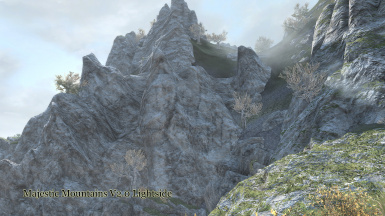 Majestic Mountains is using meshes with more polygons than SMIM. It is highly recommended that you overwrite the SMIM meshes. Except for rocks which got a compatibility patch in the installer. 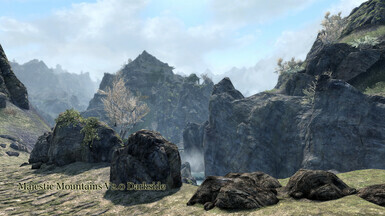 You can use Enb mesh fixes with Majestic Mountains. If you are asked to overwrite then choose yes. I added several compatibility fallbacks in the esp and the textures. 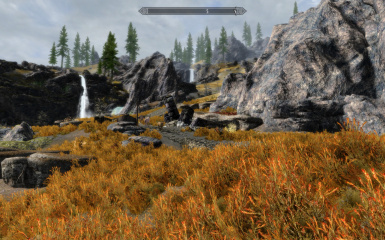 with Vanilla lighting and most weather mods the grass fading on the Tundra should be almost invisible. especially with Verdant! But since grass uses only ambient lighting this fitting might be destroyed depending on the daytime and the lighting condition. 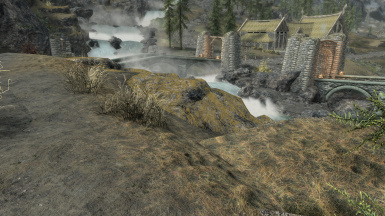 Enb makes it usally worse. This is an engine limitation and I can't really fix it. the moss and the projected snow sometimes tend to create stripes. This is an engine limitation of the projection system. I could work around this issue pretty good. But there is no way to fix it completely. The snow textures of the Complementary Pack are having a pretty specular sparkling. 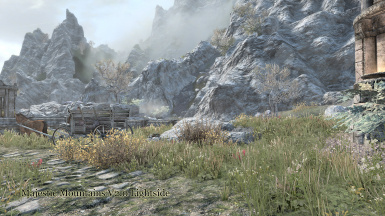 But Skyrims Snow Shader removes it somehow. If you want this sparkling effect then disable the snow shader. 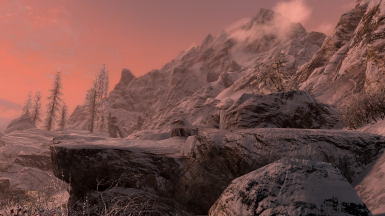 there seems to be an issue between the snow shader and Enb on some systems like here: https://staticdelivery.nexusmods.com/images/1704/8933251-1533458911.png I ca't reproduce the issue. But disabling the snow shader helps and the game doessn't look worse without it.